It is a puzzling sort of Tuesday today, so I am staying in my house to try and solve the puzzle. The rabitman has been unusually mysterious about his disappearances over the weekends and we haven’t been for proper walks because he hasn’t had time. At least we all had a proper grooming last night and some of the loose winter coat has been removed. The rabitman collected a whole bucket full of donkey hair. Morris tipped it over, of course, and rolled it around the paddock, so the rabitman had to sweep it up again and put it back in the bucket. That will teach him to be unusually mysterious. Why are there blog pages that only regular readers can see – with a password – and we are not allowed to see them either? I cannot see the point of writing a blog if you are just going to hide it away. Matilde thinks the new “Project” must be about food. 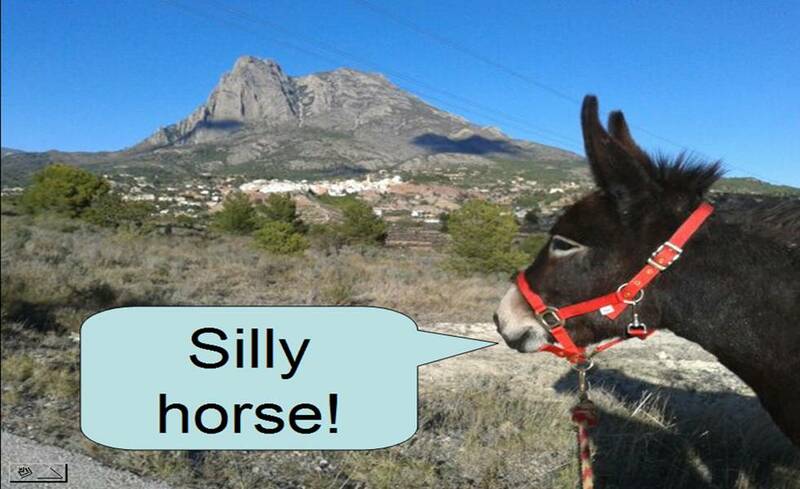 Silly horse! Morris was more sensible. He said, “You don’t have any clothes, Aitana. Why should the rabitman make you a dressing table?” Aitana got very sulky and reminded Morris that the rabitman made a nice flowery Easter bonnet for her once, and a dressing table would be a very useful item of stable furniture for such occasions. Morris, on the other hand, is handicapped by his own ridiculous fantasies. He is quite convinced the secret project is to create a chariot racing track around the paddock. Ever since the rabitman bought a secondhand pony cart and started training Morris on long-reining he had the idea that he would one day be a famous chariot racing donkey. He really enjoyed galloping down the hill one day around a very sharp bend and giving the rabitman the biggest scare of his life, and the cart has not been used since. Until it has been fitted with a brake, there will be no more charioteering. Well, there we are. What do I think? Tuesday is my thinking day, so I’ll carry on thinking. I don’t know what to think just now, so I shall eat some tree.